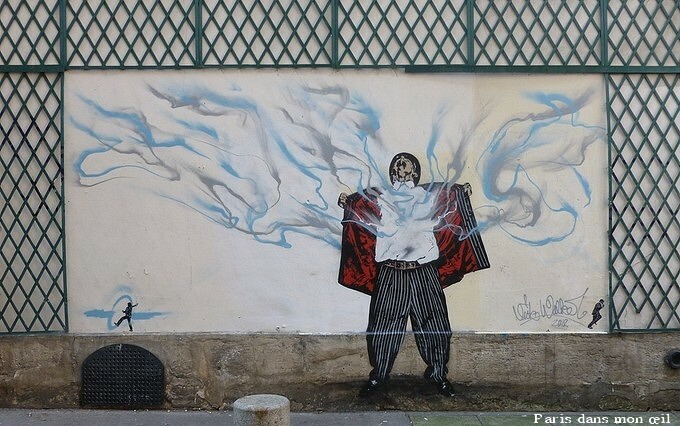 A beautiful street art discovery with the artists Nick Walker and SheOne. Currently in Paris they have already put their signatures on several walls of the capital. A very successfull artistic meeting between the abstract work of SheOne which gives energy and movement to Nick Walker's stencils. Original stagings with graffiti as main theme, and recurring and contrasting characters... A very British gentleman wearing striped suit and hat, but also a vandal gentleman and graffiti artist with a spray can or a can of paint. And also an almost innocent girl wearing red dress, white socks and red ballet shoes... Yet, she is also a graffiti artist and hooded. Two characters opposed to the usual representations of graffiti artist and taggers, but also clothes worn almost like a disguise to hide an activity still illegal.